Robert Lee Harrah, age 94 of Nebraska City, formerly of Union died March 18, 2019 at CHI St. Elizabeth’s Hospital in Lincoln. Bob was born September 6, 1924 in Tecumseh, the son of John Robert and Kathryn (DeFreece) Harrah. Bob and Betty Harrah were married June 9, 1943 in Nebraska City. 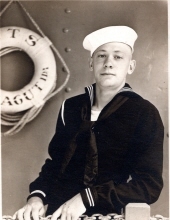 Bob served in the U.S. Navy during World War II and was a Navy Aviation Mechanist Mate First Class. He was a member of the Eagles Aerie No. 968, Methodist Church, American Legion Post No. 235 of Union. He was a member of the Union Volunteer Fire Department for 47 years of which he served as Fire Chief for 43 years. Bob owned and operated Bob's Garage in Union for many years before he retired. Bob is survived by his wife Betty of Nebraska City; son, Robert O. Harrah of Lincoln; daughters, Pamela Teten and husband Ron of Lexington and Sue Rodriguez and husband Tony of Adams; daughter in law, Georgia Harrah of Nebraska City; sister, Marge Drennan of Springfield, MO; 13 grandchildren, 37 great grandchildren; 1 great great grandchild; many other relatives and friends. He was preceded in death by his parents and son, Wesley R. Harrah. To plant a tree in memory of Robert Lee Harrah, please visit our Tribute Store. The family will greet friends from 5:00 to 7:00 P.M. There will be no viewing. The family will greet friends for one hour prior to the service at the funeral home. Burial of ashes will take place at a later date at Wyuka Cemetery in Nebraska City. "Email Address" would like to share the life celebration of Robert Lee Harrah. Click on the "link" to go to share a favorite memory or leave a condolence message for the family.